Y ou don’t have to spend much time in Austin to hear the line that the city ain’t as good as it once was, but Gina Chavez has been around long enough to know that’s not quite right. You just have to know where to get lost. Chavez was born here. She grew up in a house situated along a stretch of the city’s revered Greenbelt, which basically served as her backyard. She cut her singing/songwriting teeth as a teenager at the iconic Continental Club on South Congress and Momo’s on Sixth. 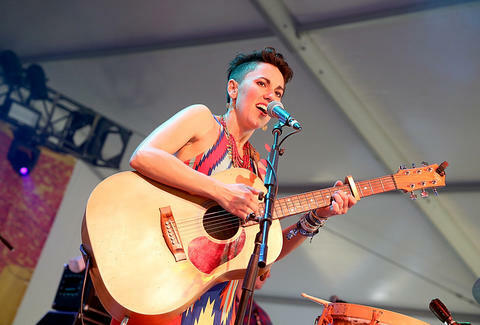 And two years ago, she stormed through the Austin Music Awards, winning the city’s top honor, Musician of the Year. She says that left her pondering the same question that faces a lot of young Austin artists, who struggle to differentiate themselves in a city so inundated with musical talent: Is it better to be in Austin or from Austin? She left to find out. But after touring and working for nearly a year and half around the world -- from France to Japan to Saudi Arabia -- she’s back in her hometown to stay. Why was it so important to get out of town for a while? Gina Chavez: Traveling has always been important to me. Growing up my family had a VW bus and we’d take camping trips up the West Coast and into Canada. My parents had an epic trip to Europe in the ‘70s, and I heard their wild stories. I wanted to experience that, and I’ve always thought if I left Austin for good I’d look to another country. But, really, leaving made me want to come back and understand the draw of Austin. When I came back it was like, Hey, I get it. I get all the things that Austin has. Even though in a certain sense we are a very small city. Your music doesn’t feel small city. Did you develop that sound growing up here? Chavez: No. I went to Argentina for a semester while I was at UT and ended up hearing this music called la chacarera and, in a sense, it was the first time I had heard Spanish music that really called to me. I had occasionally heard Spanish music growing up, some ranchera, but it didn’t hold me or grab my attention. Hearing the chacarera was like a doorway for me to tap into my Latin roots through music. So it was nice that people liked it, even though it’s in a language they don’t understand. But it also speaks to the scene here. There are only certain audiences that go to certain venues. You’re more likely to go see me at Stubb's instead of La Palapa, which is a random Mexican food restaurant on the East Side. That seems like a common knock on Austin. It’s very white. And that seems to intensify with SXSW. We have this massive festival that caters to white kids. Do you agree with that? Chavez: Austin has a long way to go in terms of diversity. When you go to other cities, DC or New York, you can walk down the street and hear five different languages. That’s what a city should sound like. You don’t have that here because most of the people moving here have the same backgrounds. The same amount of money in their pockets. Historically, we’re one of the most segregated cities in Texas, at least, if not the United States. You can look at old population maps and see that Interstate 35 was a very intentional way to divide white and non-white. It’s infuriating how little that has changed. I-35 still serves as a huge billboard to say, “Hey, you don’t live here. Not on this side.” That’s our foundation. It’s drawn in the very fabric of what our city is. Does that make it hard to grown as a musician here? To find a diverse audience? Chavez: The city is great for musicians. We have all these amazing music organizations in Austin. Things that help with healthcare and housing. So it is a great place to be a creative. But, at the same time, there is a whole population of musicians who aren’t part of that community because they don’t speak English. They play gigs at churches or people’s houses or Mexican restaurants and other places I don’t even know about because even our little community is segregated. So what places come to mind for you? Where would you go to experience something different? Chavez: It’s sad, because I don’t know. I was at the music store the other day and I was looking at some congas, and this guy comes up and starts playing on some of the congas, and we started talking in Spanish. He was really a great player, and I asked if he was in a band. He was, and he said he played all the time. He mentioned a bunch of places -- churches, and people’s backyards, and restaurants, and festivals I had never heard of. Church is actually a good example. I’m Catholic and I go to mass at St. Austin, which is a very traditional setting. But sometimes I’ll go to Cristo Rey, which is on the East Side, on Cesar Chavez St. I love it. There will be people falling out of the doors. There’s a mariachi band doing the music at mass. It’s like being in a whole different city. But it’s also sad to me that there’s no cross-pollination. But I’d say Empire’s [Empire Control Room] has a great vibe. TuezGayz at Barbarella is a lot of fun. I love the Belmont. 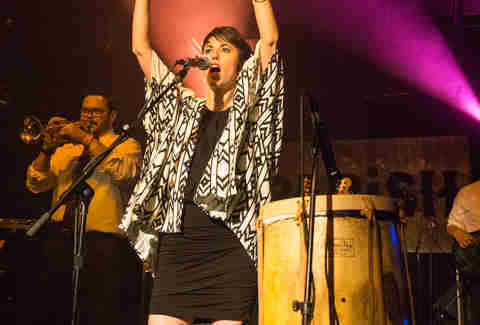 We played a freezing New Year’s Eve show there with Groupo Fantasma and it was amazing. You can cram a lot of people in at the Belmont and still feel like you have space. We also have an annual benefit at the Stateside Theatre, so that’s kind of become a home for us. It’s becoming an off-the-beaten-path music venue. What about when you need to get away from the grind? Where do you go or like to take people? Chavez: My fiancé and I love Alamo Drafthouse. That’s usually date night. I try to stay away from red meat, so that makes food options limited. But I love going to Thai Fresh. Picnik is my new favorite spot, but it’s a little expensive so probably better for special occasions. I’ve been to Japan a couple times now, and Kome is the first Japanese restaurant I’ve been to in town that feels authentic. But being outside is what makes Austin special. I still enjoy going up to up Mount Bonnell, even if it’s one of those places that was cooler when I was growing up. I love going to Zilker on my bike. You can’t beat biking around Town Lake. And honestly, just driving across the Congress Avenue Bridge at sunset never gets old. I love seeing the purple crown in the sky in the evening. I grew up along Shoal Creek. We’d spend hours walking through the creek, and there used to be a lot of pyrite. My brother and I would take chisels and hammers down there and pretend we were hunting for treasure. We called it Shoal’s Gold. Austin has been an amazing place to grow up. So even though we’re not a New York or a DC, we do have a lot of physical features in the land itself. There are a lot of things Austin has to offer that a lot of places don’t. Paul Knight is an assistant editor at Texas Monthly who lives in Austin.